Navigation through content is one of the key purposes of Information Architecture. By defining navigation structures separately from the content itself, AxXMS.net is able to realize significant advantages. Content is available as a set of pages. A hierarchical navigation structure (or multiple structures!) can be built on top of this information. Navigation hierarchy is created by th editor in the Management System. Navigation is a tree, the depth of the tree is not limited. Every navigation node has some basic properties (Name, Description, Additions - extensible by Developer). Every navigation node can have Pages (or Documents) assigned. There are two kinds of assignment possible. A Page (Document) assigned as a Standard Page (Document) is the one which is shown to the end user when she clicks on the navigation node. A navigation node can have only one standard assignment. (A Page / Document can be assigned as standard to as many navigation nodes as needed). Pages / Documents can be also Attached to a navigation node. Any number of Pages / Documents can be attached to a single navigation node. This kind of assignment does not have any immediate consequence. However it defines the fact that the Page / Document has a logical relation to a given node, even if does not immediately appear when clicking on this node. It can be useful for subsequent content, which is linked to the standard page. By using attached navigation node, it is possible to highlight the navigation in the right way for the user. As every Site has its own navigation tree, assignment to a navigation node defines which Site a given Page / Document belongs to. 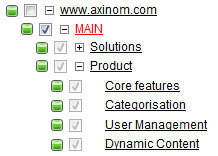 A list of Sites is available in the management system in the Home-menu (the leftmost item in the top menu). The cloning feature in AxCMS.net is a very convenient feature. It allows the editor to clone whole navigation subtrees, including all the assigned pages and keeping all relations. This feature can save the developer time and reduce errors when creating similar navigation trees.